The new Fairy Tarot by Doreen Virtue and Radleigh Valentine is exquisite, with silver-edged cards and stunning artwork. It is a joy to look at and a pleasure to use because it is beautiful. It is like a collection of miniature, gem-like fairy paintings. When I first got my set I kept looking through it simply because I was enchanted by the pictures. 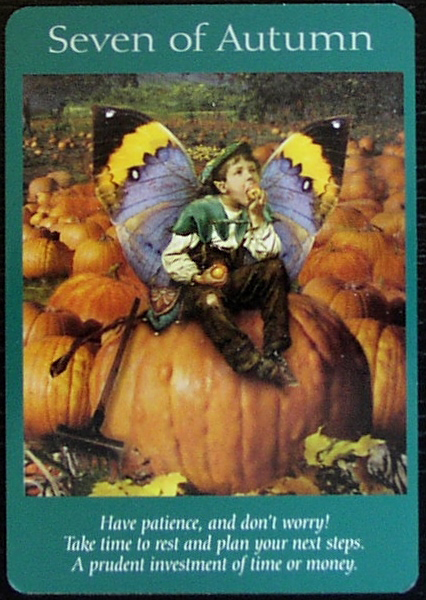 What the Fairy Tarot is not, is a Raider-Waite-Smith clone – deliberately. 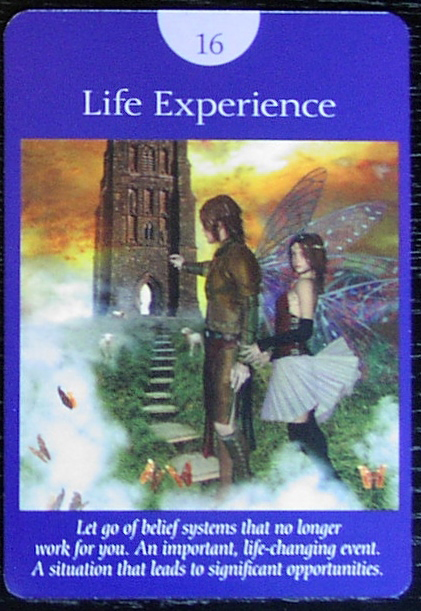 Like Doreen Virtue and Radleigh Valentine earlier Angel Tarot, it is designed as a gentle deck without the overly-scary images – such as the Tower or the Devil – found in common tarot sets. That doesn’t mean the essential meaning of the cards has been lost. For example, as in the Angel Tarot, the Devil becomes Ego and represents being entrapped by unnecessary anxieties and attachment to material things; while the Tower becomes Life Experience and indicates a wake-up call that a situation can no longer be ignored. To help with interpreting the cards, all of them have a few key words at the top and a brief description of the meaning at the bottom. This makes the deck perfect for novices to tarot who want an easy way to start doing readings. The book that comes in the box contains longer descriptions of each card as well as an introduction on how to use them with basic layouts and spreads explained. Apart from the appearance, one of the things I really like about the Fairy Tarot is that the traditional suits of wands, cups, coins and swords have been changed to seasons – spring, summer, autumn and winter. This has been done to reflect fairies as being nature spirits, but is useful for questions about when things are likely to take place. I also found like the way the suits’ meanings translate into the energy of each season; spring as a time for growth and action, the joyful emotions summer brings, autumn’s harvest time and the biting cold of winter. But don’t let me imply that the suit of winter is all about hardship. The winter cards are, in my opinion, the most enchanting of the lot, showing sparkling ice crystals and fantastic winter scenes. One might have to wrap up warm to protect against the chill, but there is beauty to be found and, with the turning of the year, times of difficulty will pass and give way to something new. Another thing worth mentioning is that some of the cards depict the sacred landscape of Glastonbury, including Chalice Well, the Tor and the Abbey, while some others show Rosslyn Chapel in Scotland, associated with legends of the Holy Grail. These are especially nice touches for anyone who lives in the UK. Publisher Hay House says about the deck: "In the Fairy Tarot Cards, Doreen Virtue and Radleigh Valentine focus upon manifestation of the supply and support you need to move forward with your life purpose, make healthful changes, adjust your priorities, provide for your family and bring healing to the planet." Personally, I think it is a great beginner's deck, particularly for anyone who likes fairy art. Very interesting and lovely cards. It is meant as a light deck and aimed at beginners to tarot, but the artwork is beautiful - I like it mainly for that reason. Hi, I've found your blog through a Google search. Your review is very informative and this set sounds just what I've been looking for!